Voters cast their ballots among an array of electronic voting machines in a polling station at the Noor Islamic Cultural Center, Tuesday in Dublin. Two-term state Sen. Troy Balderson, is fighting off a strong challenge from Democrat Danny O’Connor, a 31-year-old county official, in a congressional district held by the Republican Party for more than three decades. 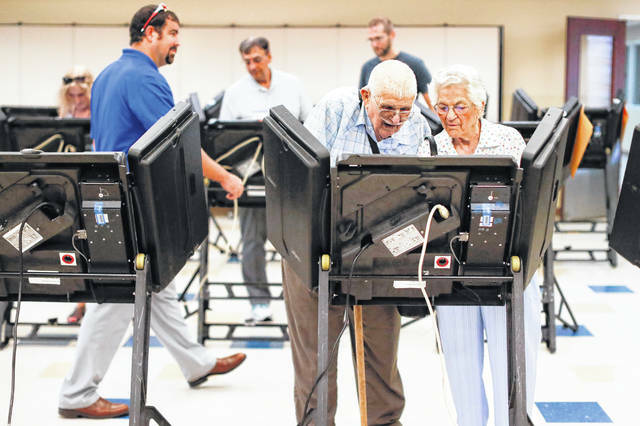 WESTERVILLE — Two high-stakes elections that tested President Donald Trump’s clout and cost both parties millions of dollars were too close to call early Wednesday. Trump claimed victory in one nevertheless. “He is a fantastic guy who loves his State and our Country - he will be a GREAT Governor and has my full & total Endorsement! Strong on Crime, Border & Military,” the president tweeted on the eve of the election.